"The ammonia in here is burning my eyes!" Looking at attached picture (which may I add is not that great), any idea what this could be? Parasite? It almost looks like a tumor. PS: Oh, you can go further. Good evening. Thanks for the opportunity to ask a question. 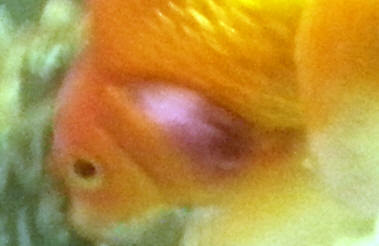 .My goldfish has a Red Bulge coming out of its gills and its bright red and it looks little white too. It almost looks like a tumor growing out of it gills. Obviously, my phone did that for some reason. I apologize. Rude response by the way. You should work on your interpersonal skills. It will help you go further in life. I am having an Ammonia Problem. I have a 20 gallon tank with four Goldfish. I have had the Rubkin for a while and just upgraded him from a 2 gallon tank 2 weeks ago. About 7 days ago I got him 3 new friends. Another fancy type goldfish and two very small basic goldfish. One of the small ones only lasted 2 days. I went to the pet store to replace him and have the water tested. They said that my Ammonia was slightly elevated, but said it was fine to get another fish and told me to change 10% of the water. I bought a test kit and went changed about 20% of the water. When I tested again that evening the ammonia was in the 3. ppm "harmful" range. the next day I changed 50% of the water, and have changed 50% ever day since. My ammonia level is still at 1. ppm? I do not think that the tank is over crowded considering how small they are. I am feeding twice a day- and scooping out what little food isn't being eaten within 2 min.s. I have a regular hang on the back carbon filter and added a bubble stone from the small tank. I had the one death and now my Ryukin is acting sluggish, but the other fish seem to be fine. Any help would be appreciated. Thank you for your time and thank you for the site, I'm not sure what would happen to my fish with out it!! square. Each fish has a couple of these spots. The spots have an almost bluish cast- they almost look iridescent in certain light. I noticed the first spot on my smaller fish two days ago and had been monitoring it. Today when I came home I noticed that the spot is, strangely, not in the same spot as it was yesterday (it has moved from the interior of the fin and is now on the edge) and now both fish have such blotches. occupants are two small, dragon-eyed goldfish. I have a brand new Eheim Professional 3 filter with a UV light hooked up to the return, the tank is lidless and I have added a small powerhead to increase surface agitation to help combat the oversaturation in the water. I installed the Eheim about a week ago- prior to that I had an Aqueon hanging-type filter. The bigger fish has had ongoing problems with some sort of internal parasite so I have had him on a cycle of Jungle anti-parasitic medicated food. Both fish have been getting this treatment as I understand if one fish has a parasite they both probably do. The med cycle was 3 days out of every week for 4 weeks- the last cycle was completed yesterday but the fish is still presenting with thin, clear, stringy feces- it isn't trailing as it was before but the problem is still not resolved. He has been occasionally (and temporarily) swimming sideways so I don't want to continue with a medication that may harm his kidneys. This leads to my first question: I'm not sure what to do to identify and eradicate this intestinal problem.. short of buying a microscope to try to positively identify the parasite, what should try next? Could it possibly bacterial in origin? 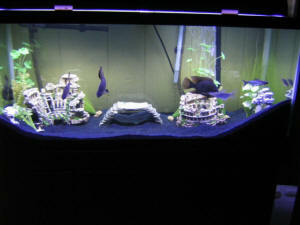 I do have a 20 gallon tank at the ready that I can use for a treatment tank if needed. I generally lower a small glass bowl into the water, they swim in and the "fish elevator" takes them away to be fed.. (they don't seem to mind this at all but if anyone has any suggestions as to how I can feed them a healthy diet in situ without having to do three consecutive water changes to get rid of the floating matter I'd really like to hear your story... I think part of the trouble may be that these fish can't see very well at close range). So there is a bit of background- as you can see I am a real stickler for water quality so am mystified at this sudden bloom of whatever it is.. I just tested my water 10 minutes ago and these are my readings: ammonia- zero; nitrites- zero; nitrate- three; pH 7.2 temperature is 72 degrees. To help my tank cycle, I turned off my UV filter and added some live bacteria to the water: this was yesterday- after the patches began to appear- so this is not the cause of the "fungus". I have not added any new items of decor. I can't find anything relating bluish-white patches (unless these begin to look cottony in the next few days). Do you have any idea what this might be? 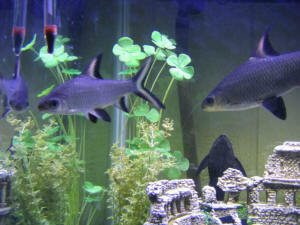 My fish are both a bit lethargic today and my larger fish is periodically bottom-sitting and fin clamping. As I mentioned, he was sporadically swimming sideways the other day which I am attributing to his persistent intestinal problem. He is a bit of a lop-sided fish: one of his eyes is quite a bit larger than the other and one side of his body (opposite of the eye) is a bit larger than the other side. He is going to have half a skinned pea for dinner and I am considering the addition of some Epsom salts- would a bit of Epsom salt perhaps help with the mysterious fungus? Will it kill off any of the live bacteria I added to the tank? I have had a few run-ins with white cottony-looking spots in the past few weeks, which did clear but left some fin damage in their wake. This doesn't quite look like the same stuff as it is quite bluish and looks "flat" but I guess it could be: so far no actual fin damage has been noted. Thank you so much for your help. I find it somewhat amusing that I am writing to a complete stranger about the bowel habits of my goldfish, but I am very grateful that you are there to answer!! Hi Neale- thank you for the response! That is the funny thing- I don't think the bluish-white patches are ammonia burns as until yesterday I was using a product by Seachem called Prime which is a water conditioner with an ammonia lock. I treated the entire tank with every water change (as it only locks up the ammonia for 24 hours). I test the water daily, just before performing a water change and have never had a positive reading for ammonia: if it is a chemical burn I'm wondering if I was adding to much Prime. I will find out soon as Bob suggested I stop using it to give my tank a chance to cycle. He felt it may have been interfering with the cycling- I set the tank up and ran it without fish for two weeks then transferred the fish (they have been in it for almost a month now). I was getting nitrate readings of about 10 when I added the fish- but these have slowly gone back to zero so I added another bottle of live bacteria the other day. Not sure what happened but if the ammonia is being locked by a chemical process then perhaps the ammonia cannot be converted by the bacteria? The product says that it doesn't interfere with biological filtration but a lot of products promise the moon. if the spots clear then I was indeed adding too much! I added another bottle of live bacteria two days ago and am now using a product that only removes chlorine, chloramines and heavy metals. Both fish have dark tails so it really stands out. The bulb is an Aqueon rapid-start (came with the hood- not a special bulb) but the light it casts has a violet hue (not to imply that it is an ultra-violet bulb, though. but it did not). Have you ever heard of this before? I'm going to go ahead with the Epsom salts to help poor fish with his constipation problem... how long should I keep Epsom in the tank? hasn't helped. I do have a bottle of 100% Metronidazole but Bob mentioned that I should be careful with it as prolonged use can cause problems.. and perhaps I'm not targeting the right bug. The fish is already a bit of a clumsy swimmer I don't want to give him anything that might damage an already wonky swim bladder. I may just have a finicky fish, but from what I have read the long, clear trailing feces almost always indicates an intestinal parasite of some sort so I will look for the Flubendazole. I'm glad that you said internal bacterial infections are rare because I have antibacterial food pellets but they take two weeks to work- I don't think the fish would be in good shape without some vegetables in his diet! Thanks for clarifying the issue with the water conditioner. I all of the blogs and articles I have read that the ammonia lock only works on tap water.. that explains quite a lot. 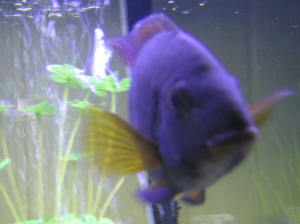 In fact I had been treating the entire tank every day on the advice from another site. The more I learn (and wow, is it difficult to sort out truth from opinion in many cases) the more I want to apologize to my poor fish.. Regarding the spots- I don't think they are iridescence as they appeared so suddenly- ammonia burns now make sense (I'm so sad- I've been trying so hard to make this tank into a happy place for my fish... I am amazed by these inquisitive little creatures. In fact, you and Mr. Fenner both wrote very nice responses a while back to a question I had regarding goldfish intelligence). Another geologist- what a coincidence! (though I'm currently back to school on a career change).